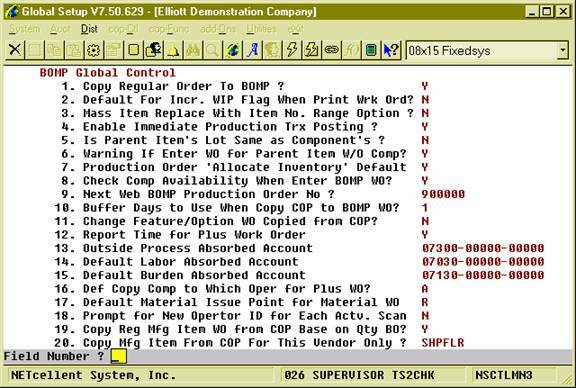 This enhancement allows you to copy a regular order with manufactured item(s) into BOMP as a work order (like feature/option item(s)). You can define a range of order numbers to copy into BOMP. The system will then create the production work orders. This enhancement is very simple to use. 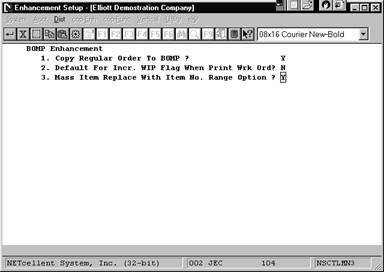 It is similar to Standard Elliott’s copy feature item to BOMP function. When you enable the enhancement (refer to Figure 71.1), the system will display a second option, “Copy Regular Mfg. Item” (as shown in Figure 71.2). After enabling this function under Enhancements Setup, the system will display a second option, “Copy Regular Mfg. Item” when you select copy COP Order into BOMP. 2. Default For Incr. WIP Flag When Print Wrk Ord? This is a convenient function. It allows you to predefine the default values to “Y” WIP Distribution and Inv Reduction, “W” WIP Distribution Only, or “N” NOWIP. Default For Incr. WIP Flag When Print Wrk Ord? There are three options: “N” = No WIP, “Y” = WIP Distribution, and “W” = WIP Distribution Only. 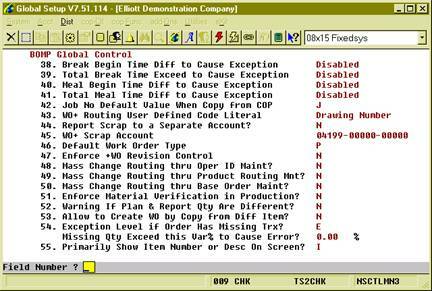 This function enhances the Standard Elliott Mass Item Replace function in BOMP. The Standard Elliott function will replace all parent items with the new component(s). However, with this feature, you can define a range of parent items. Figure 3A.5 shows the Mass Item Replace With Item No. Range Option enabled. 4. Enable Immediate Production Trx Posting? Allows production transactions to be immediately posted. 5. Is Parent Item’s Lot Same as Component’s? Indicate whether the parent and component share the same lot number. 6. Warning If Enter WO for Parent Item W/O Comp? 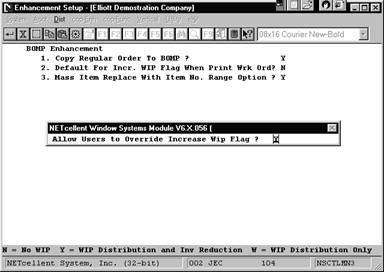 A warning can be given if a work order is entered for an item without components. You can specify if a work order should allocate inventory by default. 8. Check Comp Availability When Enter BOMP WO? 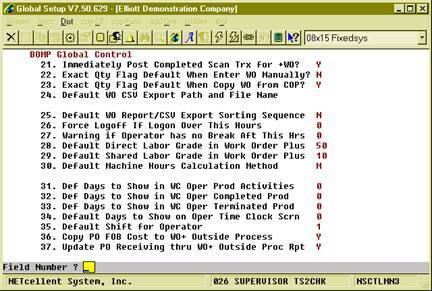 The system can check the availability of components when a work order is entered for an item. 9. Next Web BOMP Production Order No? Enter the next Web BOMP Order Number. 10. Buffer Days to Use When Copy COP to BOMP WO? How many buffer days should the system use when an order is copied from COP? 11. Change Feature/Option WO Copied from COP? Indicate whether feature and option items should be changed when copied from COP. o “Y” (Default) – The system will track operator time and production time. Labor Cost and Burden Cost will be calculated based on time information for each production. o A (Default) – Attached Operation. If the Attached Operation Number (5. Attaching Operation) is specified in the Product Structure, the system will use a corresponding operation if Operation Number exists in the routing. If Operation does not exist or the Attached Operation Number is blank, the system will use the first operation. o C – Currently Highlighted Operation. The highlighted operation will be used during data entry, like selecting a routing though Production Routing Maintenance. 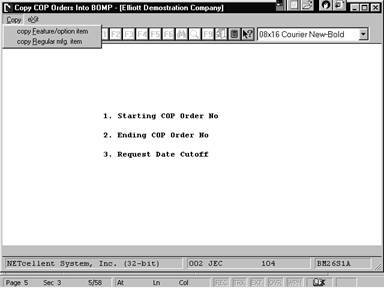 If there is no user interface, which is the case when a COP order is copied to BOMP, the first operation is used. o F – Always use the first operation. o L – Always use the last operation. Enter the default material issue point for Material Work Orders. o “Y” (Default) – The system always prompts for Operator ID and password. o “N” – The system only prompts for the Operator ID and password the first time selected. o “Y” (Default) – Allows you to post the transaction immediately. o “N” – Not allow. o “N” (Default) – The default value is “N”. o “Y” – The default value is “Y”. Enter the default path and file name for the Work Order CSV export file. o “M” (Default) – Man-Hours. Use this option when all the crew members are operating the same machine at one time. A Machine Hour is equal to the hours the crew spends on it. (Machine Hours = Labor Hours). o “C” – Crew-Hours. Use this option when each crew member is operating their own machine. A Machine Hour is the sum of the hours that each crew member spends on it. (Machine Hours = Labor Hours times Number Of Crew Members). o “Y” – The machine usually stops after the operator leaves. o “N” – The machine keeps working after the operator leaves. o “Y” (Default) – If a valid purchase order number is entered when reporting an Outside Process the system will use the FOB Cost from the PO Line Item instead of the one defined in Order Routing. o “Y” (Default) – If a valid PO number is entered for outside processing, the system will create a PO Receiving Transaction once the transaction is posted. o “N” – Never do PO Receiving though WO+. o 0 (Default) – Disable checking. o “N” (Default) – Not use another account for cost of scrap. The total production cost will increase due to scrap. o “Y” – Use another account to absorb cost of scrap. o “N” (Default) – Revision Control not enforced. o “Y” – Enforce Revision Control.